Brought tears to my eyes. Thanks so much for sharing! When you sent me the link to this, I wasn’t prepared for what I was going to read. You are an amazing woman on many levels and Jackson is so lucky to have you as his mommy (I will not reference you as big momma)! 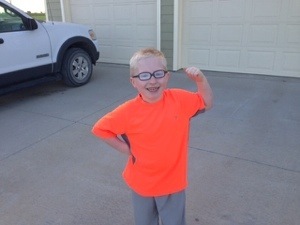 What a great support system Jackson has at school and personally…coach, teachers, family, parents, friends, etc. he truly is blessed. I can just imagine you, your mom and others running alongside that little angel. What a great, inspirational story!